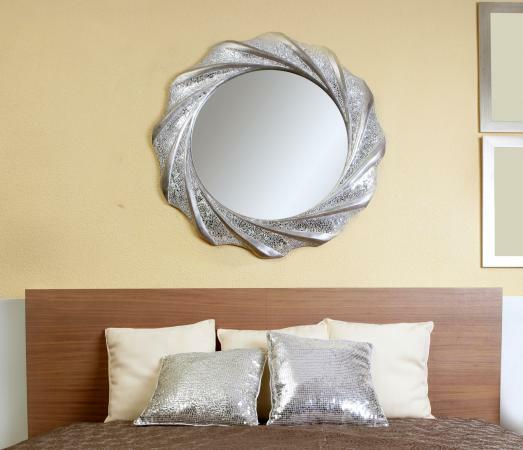 You love the mirror, but the frame is out-of-sync with your decor. The simple, economical solution is to give that old, shabby-chic frame a gleaming silver metallic finish. Spray paint is your friend when working with grooves or carved surfaces like frames, and it delivers the most even metallic finish because the paint stays in suspension and doesn't settle. Go for a clean, contemporary high-shine or a softer, gently tarnished antique finish. The difference is just a couple of extra steps. Metallic spray paint adheres well to most surfaces, inhibits rust, and is tough enough to withstand abrasive treatment. Rustoleum works best on plastic, wood, metal, wicker, and aluminum. It will not adhere well to a galvanized metal frame. Krylon paint may be used on wood, wicker, glass, plaster, ceramic, and metal, including aluminum. Complete the following steps for a basic finish. Clean the frame and lightly sand it to rough up a lacquer, polyurethane, varnish, or painted finish. Wipe away all sanding dust. Place a large piece of corrugated cardboard on a secure flat surface or the floor; spread the drop cloth over it, and lay the framed mirror flat on the padded drop cloth. Shove pieces of card stock between the frame and the mirror all around the frame to prevent paint drips on the glass. Tape craft paper over the entire surface to be protected, using low-adhesive painter's tape. Spray the frame with metallic silver paint. Keep the can about a foot from the frame and move it constantly, applying a light, even coat so the paint doesn't run or pool. Allow the first coat to dry for several minutes. Check the suggested drying times on the paint can. Apply one or more additional coats until the silver evenly coats the frame. Let the paint dry hard. Depending on weather conditions, this may take an hour or longer. Remove the tape, paper, and card stock once the paint is set up but before it completely dries. Turn the mirror over and tape craft paper over any backing that won't be painted. Repeat spraying visible sections of frame on the back of the mirror. Peel off the painter's tape and paper once the paint starts to set. Allow the frame to dry overnight, securely fixed in an upright position in a dust-free, protected area. Plain, opaque silver paint, no matter how shiny, misses the chance to add a little extra to your "new" frame for a rich custom look. A faux finish is simple and spectacular. 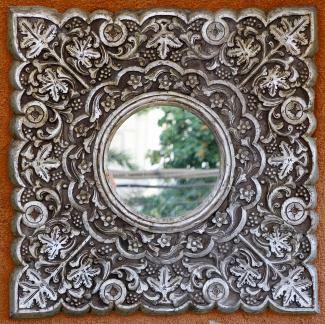 "Antique" your silver mirror frame to cut the shine to an authentic-looking gleam. Antiquing glaze, a small bristle paintbrush, and a jar of paste wax are all the expertise you need. Position the framed mirror securely in your work area. You can stand it on end or lay it flat, whichever is easier for you to work on. Dip a dry paintbrush in the stirred antiquing glaze and wipe almost all the glaze off on the rim of the can. You want a nearly dry brush. Brush glaze over the frame in light, long strokes and then go over each area while it is still damp by stippling it with the brush. Aim for an overall but uneven age-darkening or tarnishing effect. A little more glaze in carved areas and curlicues looks natural. Skip the glaze on corners or ridges that might have been rubbed or handled, and those areas will remain shiny. Don't worry about covering all the silver paint. The glaze "ages" the piece, an imprecise process you mimic by fiddling with the finish until you're happy with it. Glaze any silver-painted sections of frame on the back of the mirror as well. Allow the glaze to dry completely before the final step. Apply at least one coat of paste wax with a soft bristle paintbrush. If you have the patience, two coats or more work better. Let the wax set up according to the manufacturer's instructions. Buff the paste wax to a dull sheen with a clean, soft rag. Stand back and admire your work of art and hang it where it will catch the light and some major compliments. For a frame with interesting carved or molded detail, follow the directions to antique-glaze the silver paint, making sure to darken the detailed areas well with the glaze. Then fake a silver-leaf overlay on the ornate sections. Before the glaze dries, lightly wipe the raised surface of the detailed areas -- corner carvings or an inner "frame" around the glass -- to remove the glaze and reveal just the silver paint. Allow the glaze to dry and then apply the paste wax to finish the antiquing. Do not apply paste wax to the raised portions of the design that you wiped clear of glaze. If any wax brushes against the raised areas just wipe it off. Buff the paste wax to a dull gleam, leaving the unwaxed, unglazed details alone. Shake the can of silver metallic paint well and spray a small amount of it inside the cap, using the cap like a cup -- or just repurpose a washed individual apple sauce or pudding container. You need very little paint for this. Dip a piece of synthetic sponge or a tiny sponge paintbrush into the silver paint and dab paint over the surface of the detail. Use a very light hand to avoid dripping paint into the crevices of the design. Work in one section until you discover the amount of extra silvering that really sparkles -- then repeat that sponge-dabbing on the rest of the detail. Allow the paint to dry before re-hanging the mirror. The light sponging gives the appearance of silver leaf patina on the ornate sections of your antiqued silver frame. Consider the following tips and tricks. Safety first when using spray paints: Protect yourself by working in a well-ventilated area and using safety goggles and an appropriate respirator. Painter's respirators range from disposable paper to a strap-on face-piece with replaceable filters. Work in a dust-free, protected area where you can keep supplies away from kids and pets -- and keep them away from your project. Choose a dry day. The paint dries best at temperatures between 50 to 85 degrees Fahrenheit in low-to-moderate humidity. If your frame is plastic or bare metal, use either a plastic primer or a surface primer -- one coat will do -- before applying the metallic silver paint. Lacquer thinner will take care of any spills or smears. Just store or dispose of supplies responsibly once you've created your masterpiece. Silvering is just one technique for giving new life to an old mirror. Consider other projects, such as sponge painting or other faux finishes, to make your old mirror a new-looking showpiece.